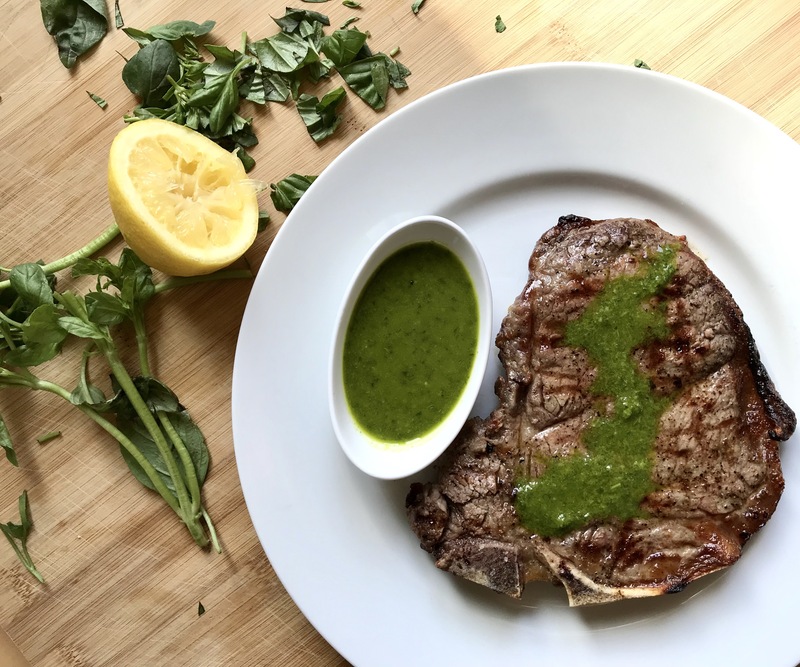 Chimichurri sauce. Let’s chat about it. Are you a fan? Do you have a favorite recipe? We love this stuff around here…like the make-a-double-batch-and-pour-it-on-everything kind of love. If you aren’t familiar with it here’s the lowdown. It’s a simple uncooked sauce that’s made to be a condiment for nearly everything under the sun. It’s most commonly used for grilled meats or fish of any kind, but it is stellar on roasted veggies or potatoes as well. It’s an Argentinian staple and is nothing more than a mixture of fresh herbs, olive oil, garlic, vinegar and a bit of acid from lime or lemon juice. Simple food at its absolute finest. I typically throw a bit of all of the herbs I have on hand into the recipe…but I always ensure there’s quite a bit of cilantro in there because we just love it. But just last night grilled steak was on the docket and I had no cilantro. All I had was basil and parsley on hand so I went with a ‘Basil Chimichurri’ and I think I’m forever sold. Add all ingredients in the bowl of a food processor. Process until combined and almost smooth. Serve immediately or store in the refrigerator for up to 3 hours. It really is so yummy…on everything!! Great to hear from you!